Work on the separate plates is a collaborative effort across the archive; the role of the Rochester team is to provide transcriptions of any text on the impressions. 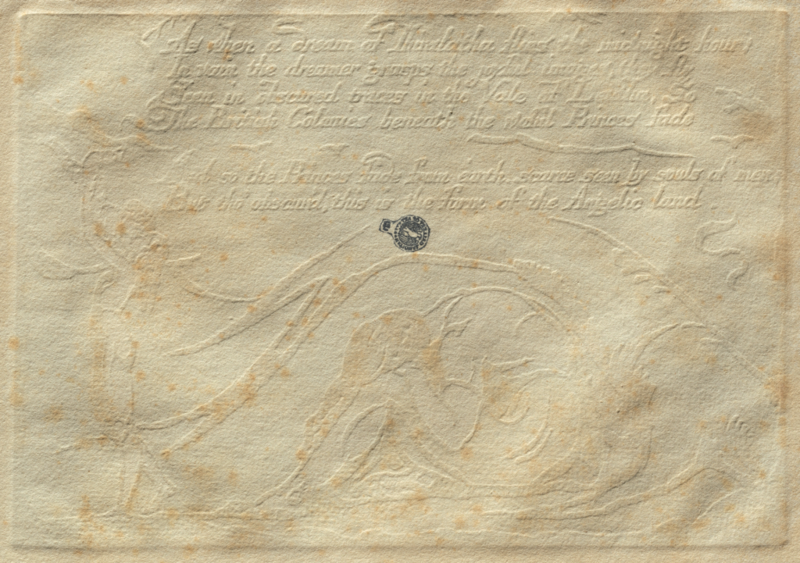 In some cases that proves very easy (“The Approach of Doom,” for instance, doesn’t have any inscriptions), and in others, as one might expect with Blake, markedly less so. One that we’ve been kicking around for a while is “A Dream of Thiralatha,” probably a cancelled plate (often called plate d) for America. 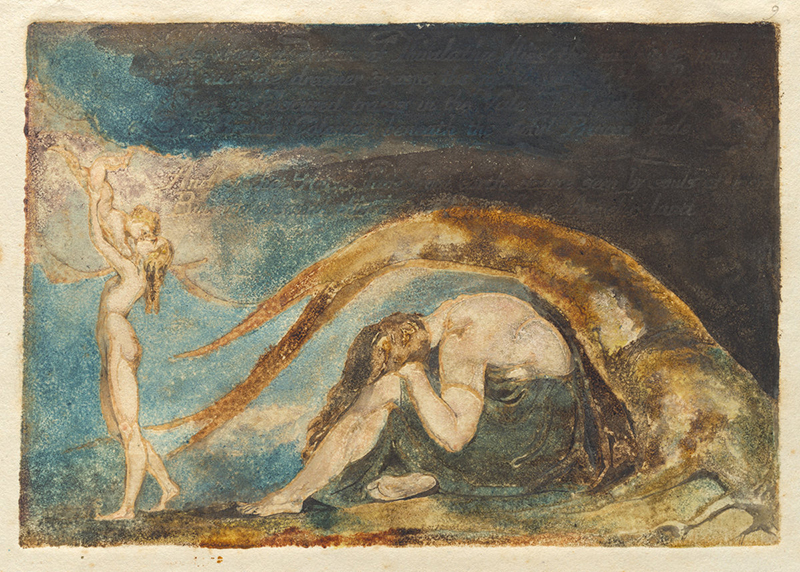 There is a single state with two impressions, one of which (British Museum) already appears in the archive as object 8 in the Large Book of Designs, a series of prints without text that Blake produced for Ozias Humphry around 1796. We’re concerned with the other impression, from the National Gallery of Art in Washington, DC. 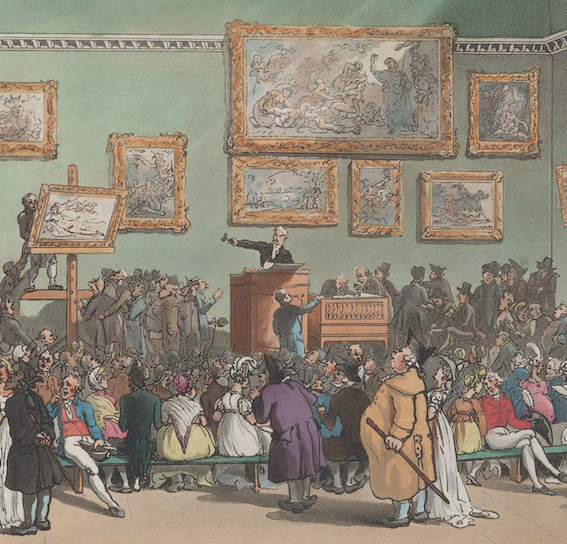 Blake’s color printing has mostly obscured six lines of text: in the impression from the British Museum, no text can be seen behind the thickness of the color printing, but the pressure of printing this impression has made words visible. We already know the number of lines and what they read because the text is blind embossed on the verso and previous scholars have transcribed it (see, for example, Erdman p. 59). 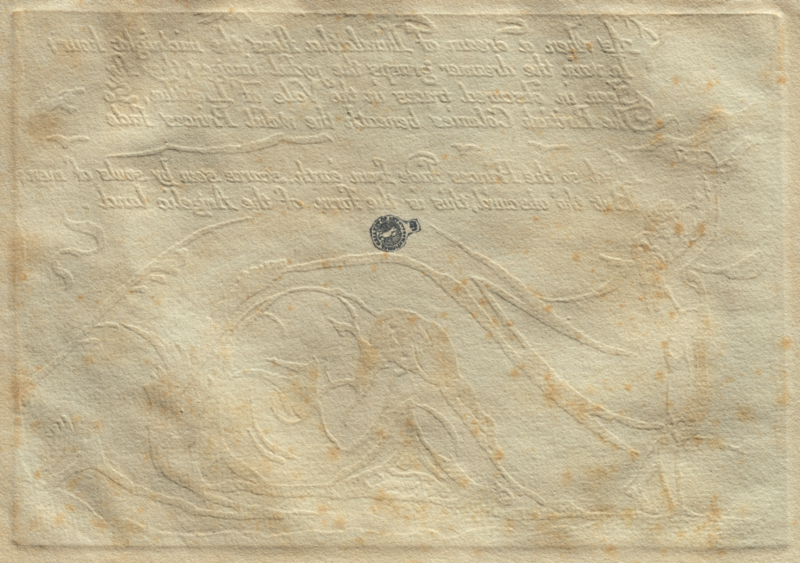 We didn’t have an image of the verso, so Eric and Alex conducted some Photoshop experiments with the recto to attempt to improve the readability. Now we have an image to justify our transcription of these six lines so that we don’t have to rely on the authority of others. That takes care of the verso, but still leaves difficult decisions about the transcription of the recto. The archive’s mantra is always to transcribe what you see, nothing more (despite knowing what the words are). But what can we see on the recto—at first glance? peering? under what level of magnification? That’s the really hard part.